We purchased as last measures of silence of muffler sound. My car had a bad boom at 1300-1600 rpm, but I could hardly hear it. However, the sound in another rotation speed range became a sound ... In conclusion, the initial use was great. This review is about item#37117351. Ideal for absorbing minor shocks, hand feel is also very good! In order to insulate the door of the conference room with seven places, I used it in one room experiment when closing with sound absorbing material · sound insulation sheet · sound insulation material · sound insulation material 12 mm, but because the sound absorption coefficient was good, I used it in all of this product. This review is about item#37117376. This review is about item#48857541. It is quite soft and smells slightly strange. I did not understand the sound absorbing effect. I thought about working using this sound absorbing material, but it is too soft Processing could not be done as I expected. The material was too soft to secure the height of the panel, and the product selection was over. Hard urethane materials should have been chosen. However, it may be good as a sound absorbing material. I pasted it on the lining of the left and right rear door. I bought both urethane tapes for the urethane together, and it was simple and batch construction was possible. I think that there was also an effect. There was a slight smell, but I do not care about the current one month old. It has strong chemical odor and can not be used. You should indicate that there is a smell. Also, I would like to know if there is information on the deodorizing method and the necessary period for it. 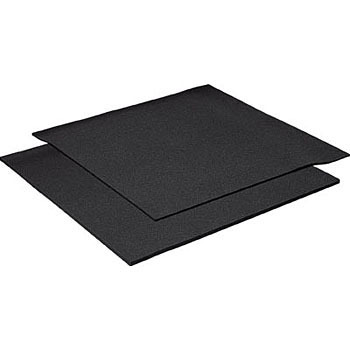 Use for sound absorption and sound adjustment around the audio system. In the past, we used glass wool as a countermeasure against standing waves generated around the audio system, especially at the wall side behind the speaker. If you try 4 foamed urethane sheets this time, it seems to be absorbing mid range. Adjusting the set position and how to wind the sheet, I got a good result.